What do “Good Will Hunting”, “Titanic,” and “Pizza, Pizza” have in common? Here’s a hint: it’s the same something that ESPN.com and “The English Patient” share. Give up? It’s The Ninth Annual Portland Creative Conference, a full-blown multimedia event where the brilliant minds behind those titles converged for an electrifying and interactive ideas exchange. There are lots of conferences, but trust me—this one’s way ahead of the pack! For three days in September, multimedia magicians, producers, directors, writers, composers, artists, and advertising legends met to share their personal insights into the creative process. Even with nearly nine hundred people seated in the city’s Center for the Performing Arts, there was an undeniable feeling of intimacy. Maybe it was the juxtaposition of the intense creative genius on-stage, mixed with the talent in the audience, poised against the backdrop of easy-going, uncommonly congenial Portland—all far removed from the usual centers of media. Whatever it was, it created a wide-open forum where ideas and opinions were freely expressed and “behind-the-scenes” stories were shared. The following are only sound-bite highlights, but hopefully enough to tease you to check out next year’s conference. After Gus Van Sant, Academy Award-winning Director, revealed new avenues of creativity discovered while directing “Good Will Hunting,” he showed some of his early work, including two 1930s-style short films done with sharp-edged political satire—one with William Burroughs, the other featuring Allen Ginsberg. The Bay Area’s own David Siegel, best-selling author of “Secrets of Successful Websites,” captivated the audience with more than his usual entertaining romp through the world of creative Websites. He treated us to an insightful look at the anatomy of a script and explained the important elements of storytelling that can make or break any project’s success. Academy Award-winning Producer of “The English Patient”, Saul Zaentz taught us the importance of allowing the unexpected to veer you off the script and showed us some of the surprising and wonderful results of such side trips. Cliff Freeman, winner of 30 Clio Awards for such commercial campaigns as “Where’s the Beef,” “Pizza, Pizza,” and the York’s Peppermint Patty “Get the Sensation,” entertained us with some hilarious clips that never made it to the screen, and many that did. “Titanic” Special Effects Academy Award winner, Rob Legato, revealed the bare-bones of the movie’s visual effects in far greater detail than any of the “how they made Titanic” TV documentaries. Could you spot the film’s seamless transitions between the virtual and the real? We couldn’t. Three “Current Thinking” panel discussions covered topics such as censorship on the Net and the future impact of HDTV. There were premier screenings of two films—”The Imposters” and “Without Limits”, plus several imaginative shorts by Will Vinton Studios. But, with all of the aforementioned luminescent talent, the most memorable presentation was one by the outrageous Denny Dent, a performance artist billed as “A Two-Fisted Art Attack.” Armed with three brushes in each hand, Dent dipped into buckets of day-glo and then, to the loud pulsating blast of “The Rolling Stones,” attacked a 6-foot-tall black canvas. 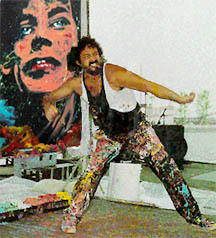 His whole body gyrated with the beat as he flung formless swipes of color across the canvas amidst the nonstop screaming and applause of the crowd until, in less than 10 minutes, a perfect rendering of the full-lipped face of Mick Jagger emerged. After a similar attack was waged on Albert Einstein, we heard the unmistakable electric squeals of Hendrix’s guitar and one last piece of art was masterfully birthed, ending with an unexpected twist that brought the house down. Denny Dent—a guy who can incite an art riot! If you weren’t among the many Bay Area multimedians who enjoyed this year’s one-of-a-kind extravaganza, mark your calendars for September 16-18, 1999. Next year will mark the 10th anniversary of the Portland Creative Conference, so when you get there, prepare to fasten your seat belts! Reprinted from: North Bay Multimedia Association’s “Multimedia Reporter”. * * * * * * * Sharon Rockey is a freelance writer and editor for print and on-line media. She writes on business, finanance, technology, lifestyle and the arts. Visit her on-line portfolio for samples of her work and see if she is right for your next project. Portland Creative Conference, 2009 – The Conference Returns! Portland Creative Conference, 2008 – The Conference Returns! Portland Creative Conference, 2001 – There When We Needed it Most! Portland Creative Conference, 1999 – Spotlight on Creativity: Portland Does it Again!